Adjustable 3-hole arrangement for ultimate stability. 9 degree float allows riders to have some lateral movement on the bike. In cycling this feature is regarded as beneficial to the rider's biology with respect to strain on the knee. Shimano SPD SH51 100% compatible. Look X-Track Series Pedal compatible. Fit most of cycling shoes. BV bike cleats compatible with Shimano SPD SH51 and Look X-Track Series Pedal. 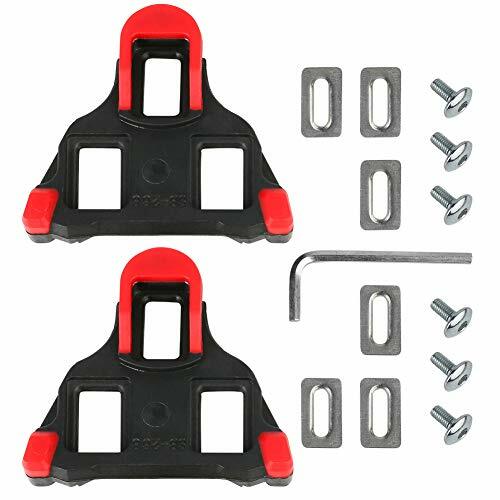 Come with optional 2-hole cleat nuts and metal plates, please note if your shoes do not come with these parts, please install inside shoes. Cleats are one of those bits of kit that get overlooked, but Look's new Keo Grip Road Cleat is tougher to ignore than most. 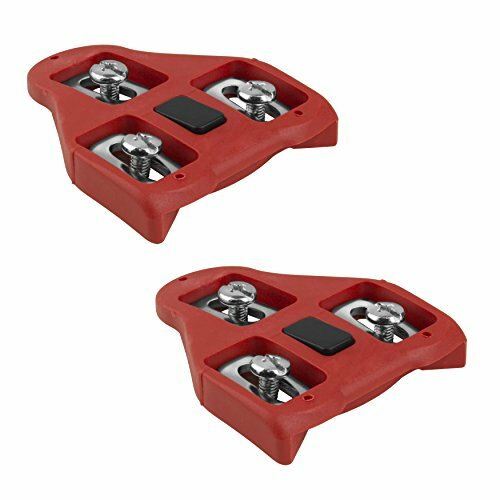 It has several obvious upgrades over most cleats, most noticeably non-skid rubber pads underneath the fore and aft portions of the cleat, but it's the unobtrusive central pad that's most exciting. 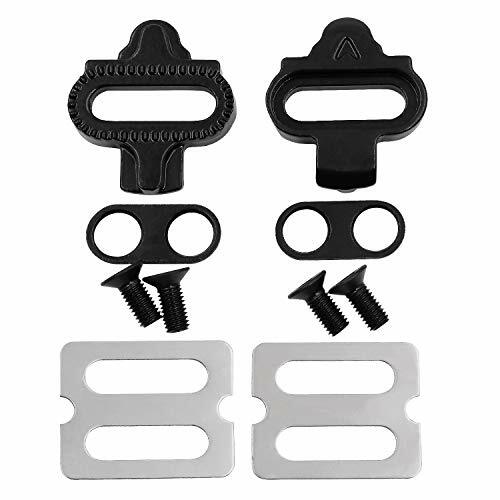 Look calls it a Memory Clip, and it locks into the center groove found in many new cleats for secure attachment and easy replacement. To suit all riders, the Keo comes in three versions: zero float (black), 4. 5-degree float (grey), and 9-degree float (red). 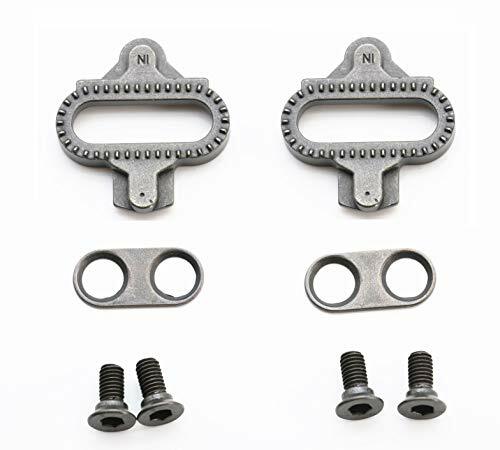 Each offers 4mm of lateral adjustment and 9mm of longitudinal adjustment, and comes with all the necessary screws and washers for easy replacement. Mountain cleats for the outdoor cycling devotee. Single release method keeps you from accidentally unclipping. 4 degrees of float offers a bit of wiggle room to clip in. Compatible with SPD pedals. All hardware included. Sold as a set. Made in Japan. Shimano's SPD-SL Cleat Set includes two cleats and all the installation hardware you'll need. 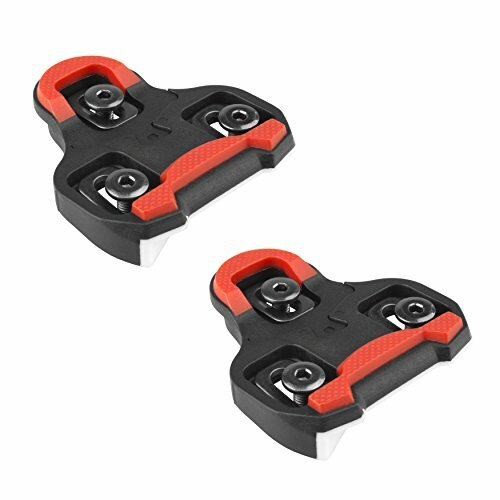 The cleat set is compatible with all Shimano SPD-SL pedals, including the Dura-Ace PD-7810 and the Ultegra PD-6620 models. The SM-SH11s are the Black/Yellow floating cleats with 6 degrees of float--this is the stock cleat that comes with the Dura-Ace and Ultegra SL pedals. Or if you prefer a fixed cleat with no float, there is the option of Shimano's Black/Red cleat, the SM-SH10. 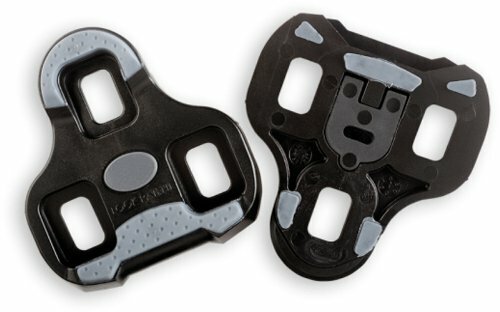 Replacement cleats for road or mountain biking shoes. Multi-directional release for a quicker release with less effort. Compatible with SPD pedals. Cleat bolts and back plate included. Sold as a pair. Add another pair of shoes to your collection or freshen up an old pair with a new set of Crank Brothers Premium Bike Cleats. They feature six degrees of float and a slightly asymmetrical design to allow either a 15 or 20 degree foot release angle depending on how they're mounted. 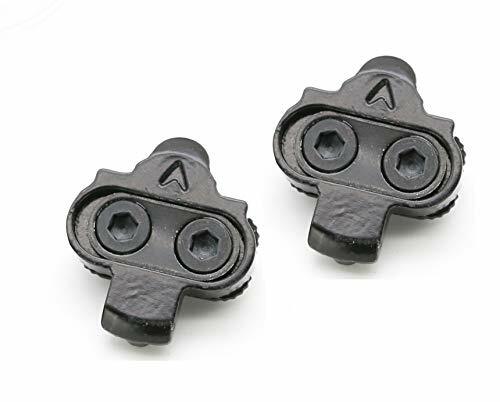 These cleats clip into your Crank Brothers Eggbeater, Candy, or Mallet pedals to get you out on your bike and onto adventures in a snap. 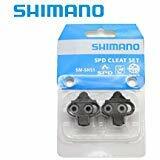 New 2014 Shimano SPD-SL Cleat Set Self Aligning Mode SM-SH11 Road Bicycle Cleats with Hardware included. 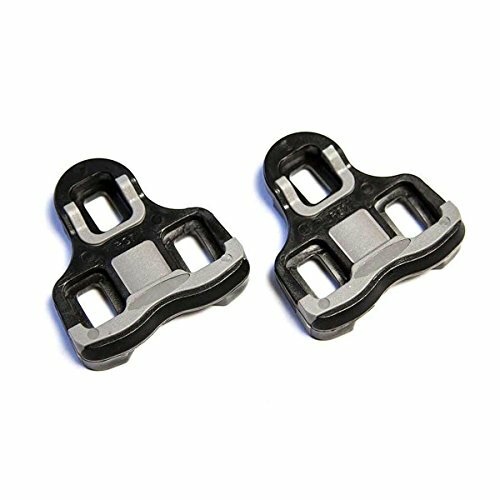 6 Floating Color - Yellow Weight: 72g pair w/ mounting hardware included Compatible with all Shimano SPD-SL Pedals: PD-9000 PD-7810 PD-7800 PD-7750 PD-6800 PD-6700 PD-6620 PD-6610 PD-5700 PD-5610 PD-5600 PD-R600 PD-R550 PD-R540 Features : The Shimano SM-SH11 SPD-SL cleat set floating mode has an extra-wide and low-profile design making it very stable between the shoe and pedal, with no movement, flex it's no wonder it's one of the most popular cleats amongst cyclists. 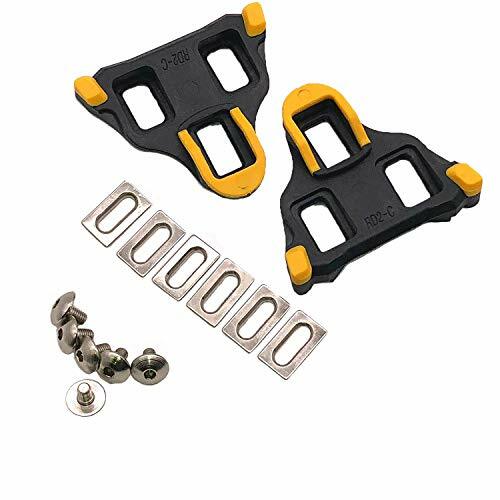 This SPD-SL Cleat Set includes two cleats and all the installation hardware you'll need. The cleat set is compatible with all Shimano SPD-SL pedals, including the Dura-Ace,Ultegra 6800,105,RP2 RP3. COMPATIBILITY: Compatible with all Shimano Road Bike SPD-SL pedals, including the Dura-Ace,Ultegra,105,Tiagra. 6 DEGREE FLOAT: 6 degree float help you reduce the pain and fatigue. Give your feet/ankles/legs assume a more comfortable position during riding. Light weight and Efficiency power transfer design. Guarantee: We afford 100% full refund if you're not satisfied with our bike shoe cleats. Types of usable pedal: Fits most of SPD Shimano pedals, Include PD-M324 / PD-M424 / PD-M434 / PD-M505 / PD-M515 / PD-M520 / PD-M530 / PD-M535 / PD-M536 / PD-M540 / PD-M545 / PD-M636 / PD-M646 / PD-M647 / PD-M747 / PD-M770 / PD-M780 / PD-M785 / PD-M8000 / PD-M8020 / PD-M820 / PD-M959 / PD-M970 / PD-M980 / PD-M985 / PD-M990 / PD-M995 / PD-M9120 / PD-M9000 / PD-M9020 / PD-M9120 / PD-M9100 / PD-T420 / PD-T400 / PD-T421 / PD-T700 / PD-T780 / PD-T8000 and so on. 1.What is differences between SM-SH51 and SM-SH56? 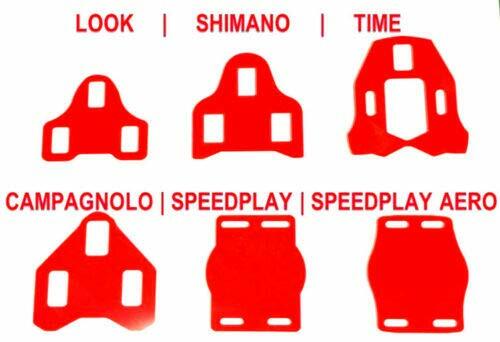 There are no functional differences, but the method of releasing the cleats from pedals. Please view the product picture above. 2.Do these cleats come with cleat nut plates? No.The nut plate that goes inside your shoe is supplied with Shimano shoes not with the cleats. 3.Is this fit for my Shimano pedals? If your pedal model does not appear above, please contact me. 6 degree cleat float or 0 degree float (fixed). Fits any 3-bolt style cycling shoe. For use with P1 pedal power meter only. Look 6007195300 Delta Bi Material Cleat - Black is a look that is often copied for cleats, but never equaled. The Look standard and its three holes is the market reference. Furthermore, the shoes themselves are only delivered with the three holes, which ensures the best stability. The Delta shaped cleat functions by a rotating movement which allows for disengagement equally from the inside or the outside of the foot. Possible disengagement of the two sides improves safety. Neither obstacle nor bearing hinders nucleating towards the inside. The new Teflon compound (white material) further facilitates engagement or disengagement while considerably reducing the possibility of parasite noises. MATERIAL: Iron, electroplate and heat treatment. Weight: 45g, easy to install with tools we gift to you. 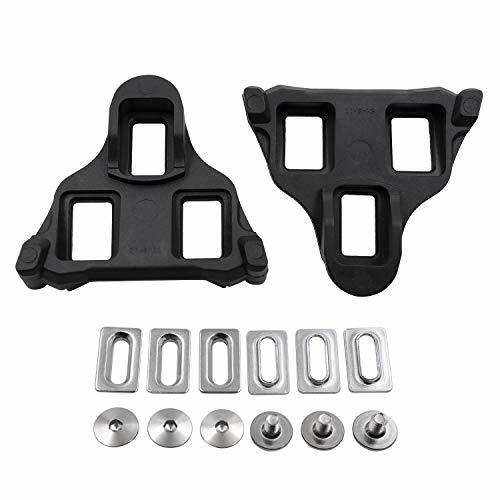 PACKAGE INCLUDES: 1 Pair of black pedal cleats, 2shims and 4screws, install tool. Every one of three cleats in the market is made by our company. And we are proudly announcing that all of our colleagues from our company uses our own product. Not only you feel very comfortable using our products but can also enjoy the scenery and cycling along the path. please add our product to your shopping cart immediately and join us to protect our environment and planet earth together! Our products have been tested by IQC and OQC, 1 year unlimited warranty. just return it. We'll refund every penny (or replace it, if there is a problem). That's the us consistent philosophy. 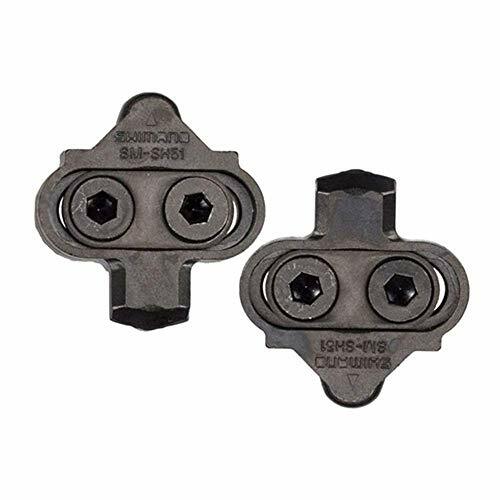 WIDE APPLICATION AND STABILITY -- It applies to all SHIMANO road bike pedals, compatible with most popular SPD - SL system cycling shoes with three holes.well accepted and trusted by consumers. MEET THE ERGONOMICS DESIGN -- A large amount of experimental data proves that 6 degrees is the healthiest float, help you reduce the pain and fatigue in cycling, this feature is regarded as beneficial to the rider's biology with respect to strain on the knee. 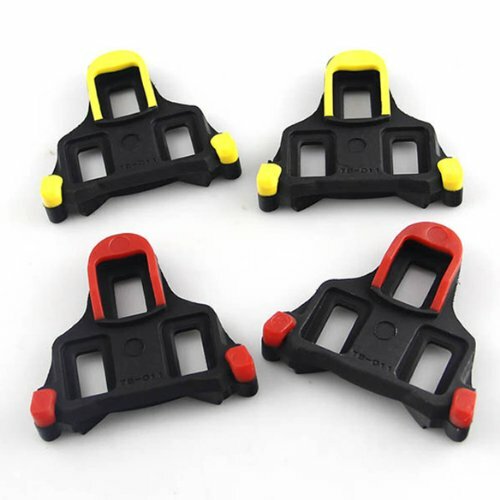 EXCELLENT ANTI-SLIP FUNCTION -- Our bike cleats are made of high quality ABS plastic and rubber, increasing friction to anti-slip, and ensuring safety and functionality for optimal performance. 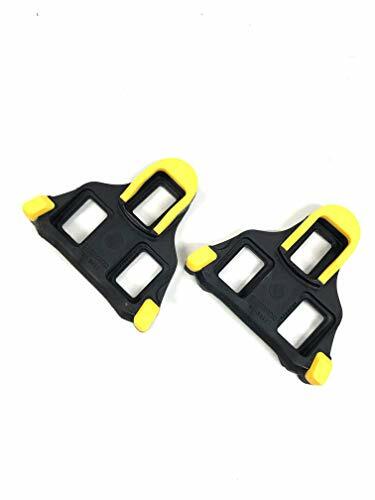 THE MOST TRUSTED CLEATS -- Excellent slip resistance and easy installation make it the most popular cleats, people often use it when riding, so they can enjoy the fun of riding and forget the fatigue. Durable - Made from metal, you can walk and exercise in them. And it won't damage the gym floor. 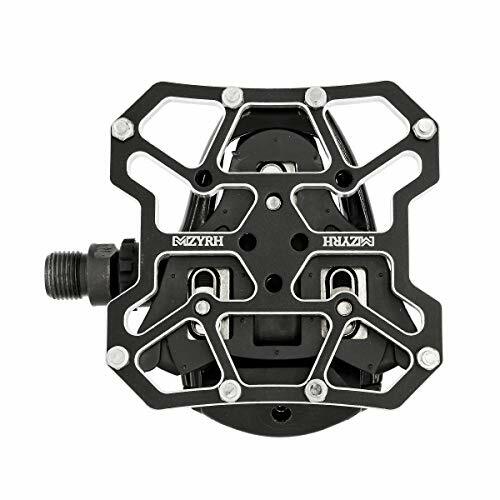 Compatible Pedal: Fits most of SPD Shimano pedals, Include PD-M324 / PD-M424 / PD-M434 / PD-M505 / PD-M515 / PD-M520 / PD-M530 / PD-M535 / PD-M536 / PD-M540 / PD-M545 / PD-M636 / PD-M646 / PD-M647 / PD-M747 / PD-M770 / PD-M780 / PD-M785 / PD-M8000 / PD-M8020 / PD-M820 / PD-M959 / PD-M970 / PD-M980 / PD-M985 / PD-M990 / PD-M995 / PD-M9120 / PD-M9000 / PD-M9020 / PD-M9120 / PD-M9100 / PD-T420 / PD-T400 / PD-T421 / PD-T700 / PD-T780 / PD-T8000 and so on. 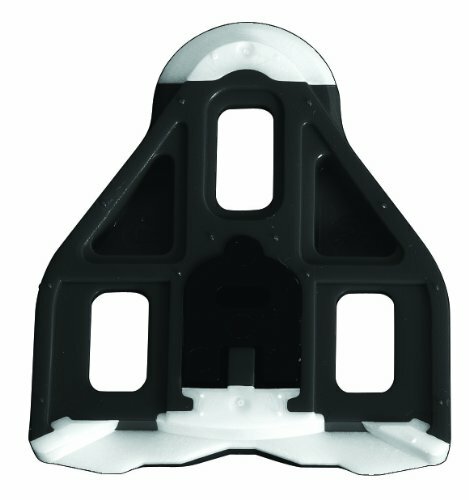 Module: SM-SH51, Fit most of cycling shoes. Improve alignment to enhance pedal stroke and reduce knee and foot pain. Flexible material follows the contour of your shoes.